As the now 41-year-old explains, when it comes to the derby, there is always a little extra bite. 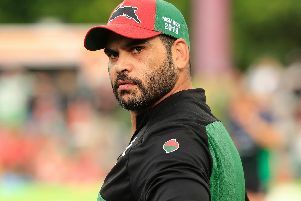 “In my era there wasn’t a lot between the two teams in certain years and some great players on show,” he said. “This week I get sent about 300,000 messages on the Good Friday game where me and Andy Farrell had a bit of a set-to. No doubt that will get sent to me on Twitter come Friday. “It was two great sides and it’s something that’s remembered in those games. For me, playing in front of a full house at Knowsley Road on Good Friday, there was nothing better. Saints laid down a marker for Friday's match with a crushing win over second-placed Warrington last Friday but when it comes to Good Friday derbies, Saints legend Sculthorpe insists form goes out of the window. While Wigan are currently tenth in the Super League and in a battle just to make the play-offs as they bid to retain their title, Saints have won nine out of ten and look the class of the league, especially following the 38-12 hammering of the Wolves. For Saints this is nothing new, after all they finished six points clear at the top last year, only to be upset by Warrington in the semi-finals. But for Sculthorpe, the only ever back-to-back Man of Steel, the key for Saints at the DW Stadium on Friday will be to forget about the Warriors’ recent struggles. 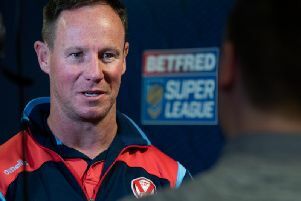 “Going into the game on the back of a great win against Warrington, Saints will be just concerned about how we perform,” said Sculthorpe, who expects Saints to come out on top. “Saints won’t be worrying too much about Wigan being out of form, or injuries. “I’ve been involved in previous derby games where we’ve been massive favourites and come unstuck. You can often throw the formbook out the window. “I still think you’ve got to go with Saints to win because of the way they are playing and the tough time Wigan are going through at the moment. “They’ve picked up a few more injuries and suspensions, I know they’ve got a lot of young players, the likes of Joe Shorrocks and Morgan Smithies turning out. But I’ve played in games where we played a Wigan side that was a team full of kids. Regardless of the result, Saints look well-placed to right the wrongs of last season and pick up some silverware. And Sculthorpe believes this year’s team is even better than the one that finished top of the log in 2018. He added: “I think this year is a stronger squad than last year. I tipped them for silverware at the start of the year. We were by far the best team last year. Wigan Warriors take on St Helens in the fiercest rivalry in rugby league at the DW Stadium on Friday April 19th, kick-off 3pm. Secure your seat today by calling the DW Stadium ticket office on 01942 311111 or by visiting https://wiganwarriors.com/tickets.